We have 101 fall freezer meals to keep you feel cozy, warm, and sane through the back to school and holiday season. The air is cool, the leaves are turning, and dreams of soups, stews and chilis are dancing in your head! If ONLY you had time to prepare those fabulous tasting meals for every night of the week. Well, you can! Here are our favorite fall recipes. Complete with freezing instructions, you can make ahead, and freeze them for the perfect fall day. Not only that, these are seasonal recipes, meaning you will save money buying produce ripe in this season. 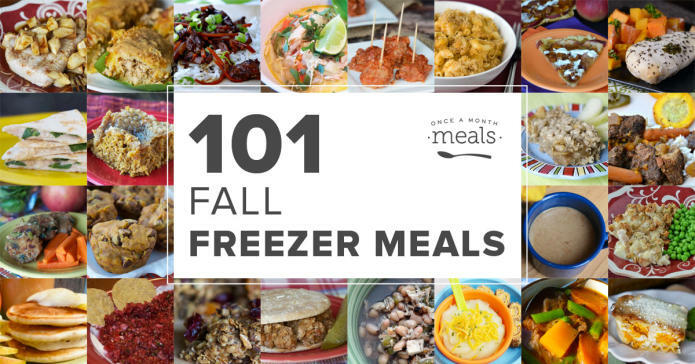 For you visual types, check out our Pinterest boards full of Fall Freezer Meals. If you happened to stumble onto this post during the wrong season, check out our seasonal posts for Winter, Summer, or Spring! If you’re interested in only slow cooker recipes for fall, check these out too! None of these recipes have appeared on our previous 101 Spring or 101 Summer lists! When I click the link to “Check it Out” on Pinterest it takes me to 101 Summer Freezer meals, not 101 Fall Freezer meals? :o) Eagerly looking for the board on Pinterest but not seeing it? Thanks! Yep, sorry about that – fixed up now and ready for you to follow away! If I sign up for a monthly membership do I have access to all menus or just one menu type? I really like the low fat and my kids are picky eaters so I also like the toddler menu. I love a lot of your recipes, and I want to share a trick I learned that you might appreciate: when freezing potatoes, like in your Rosemary Roast Beef dinner, put the potatoes in a pot of cold water (cut or sliced or whatever form you are using). Bring the pot to a boil. The second the water boils, drain the potatoes and run under cold water to stop the cooking. The potatoes are still essentially raw, but they won’t brown in the freezer. This is the second time this has happened but when I print out a recipe it is in Chinese. I just copy the recipe and put it on Microsoft word and print it out that way but I thought you might like to know. Love your recipes. Oh how odd! Do you know what recipe? Yes, this is one of our older lists – which Paleo Fall favs do you have? Hi Cindy! There is not a grocery list for the 101 posts yet but when our new swappable system comes out, you could add them to a menu and create a grocery list. I think I’m confused. I signed up & printed the 101 Fall info but it’s only 15 meals? Where does the 101 come in? Do I need to print something else? If you purchase the pro membership and do a swap will the freezing or prep instructions reflect this?